We've a had a very exciting few weeks. 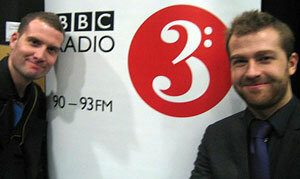 On 23rd October we played LIVE on BBC Radio 3's Early Music Show! 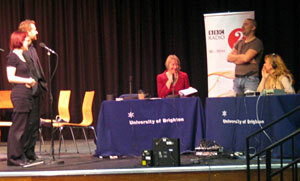 It took place as part of the Brighton Early Music Festival at the Sallis Benney Theatre. We all got up really early so we could arrive in time for a rehearsal. We had fun on the train down practising our interview skills and taking it in turns to be Lucy Skeaping – some of us found it easier than others. When we arrived we went for a soundcheck feeling very medieval with our mics. Then at 1pm-ish we were live on air. We performed three pieces from our Iberian programme which went well. Matt and Emily were interviewed so they put on their radio voices and did their best to sound intelligent! 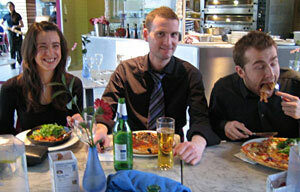 Afterwards we went for a well earned pizza. The boys practising their radio faces..
Matt was so hungry he couldn't even wait for the photo!